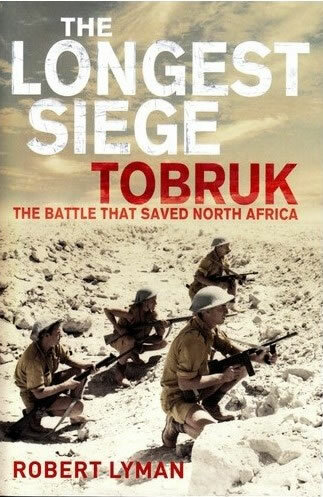 Finished The Longest Siege: Tobruk The Battle that Saved North Africa by Robert Lyman. First thing that I took umbridge with what the author’s repeated claim that the Siege of Tobruk was the longest of the British Empire. Gibraltar was under siege between 24th June 1779 and 7th February 1783 during the American War of Independence by the forces of Spain and France. That made it substantially longer than the siege of Tobruk! To learn about the Great Siege click here. Anyhow I really enjoyed this book as it took me back to my early years of reading WW2 history as a 12 year old and my fascination with Rommel and the Afrika Korps. The book is written in a very reader friendly manner and does not have the plodding history book feel the more scholarly works, such as the ones by the excellent Glantz have. Layman relies heavily on accounts of the veterans of both sides that were at Tobruk and these one on one accounts add a personal flavour to the story being told. Though it lacks some depth, some events are covered in great detail others are glossed over, the book flows well from the initial Italian attacks into Egypt and O’Connor’s counter offensive. One cannot fail to notice how easily Italian forces were easily brushed aside, though the author goes to some lengths to explain that not all Italian units wiltered immediately upon being fired on. Rommel’s introduction is handled briefly, as it should as the thrust of the book is the siege of Tobruk proper and not the arrival of the Desert Fox. I found it very interesting that very similar mistakes were made by the Italian and British commanders as Rommel basically copied O’Connor’s outflanking tactics in reverse. However one must take into consideration the fact that the Army of the Nile was weakend by Churchill’s insistence to send ANZAC troops, desert veterans to Greece to support an already defeated enemy. Rommel swept the British back to the wire with almost as much speed as the Italians had been swept out of Cyrenaica. Layman handles the build up to the siege well and I believe that, through the use of first hand accounts from both sides, portrays the initial battles very well, especially upto the first German breakthrough. He also goes to great lengths to praise the ‘Diggers’ and a strong feeling that the other Commonwealth and British troops in the garrison were in somewhat awe of them comes through. Yet he also gives great credit to the ‘Tobruk Tanks’ relying heavily on the accounts of Rea Leaky, a combatant at Tobruk. The feeling of security and confidence the British had in their Matlidas was offset by the lack of confidence in the Crusader types and the fear of the 88 dual purpose gun. This was most evident in the aftermath of Operation Brevity and the reader can almost tangibly feel the rise and ebb of the hopes of the besieged troops. The Royal and Allied Navies are given their due as well as we are regaled by accounts of transports and destroyers running the gauntlet of X Flieger Korps in first bringing in supplies then in taking out the 9th Australian Division. The Navy also suffered its far share of losses during the siege as well. The RAF also gets its honourable mention especially early on when Hurricanes were stationed within the perimeter until the airfield at El Gubbi came under direct fire and the RAF flew out. My favourite chapter of the book is ‘Siege Rats’ that goes into great detail about the day to day in the garrison during the main part of the siege. The long hot (50 degree +) days and the colder nights when patrolling on both sides became the norm. The lack of water for personal hygiene features in all the veteran’s accounts but there is enough evidence to suggest that there was a general shortage, Tobruk itself having being well stocked by the Italians before its capture. Though many a digger reminisced that in hindsight all the initial looting and wastage was not a good idea! The final chapters of the book deal with the breakthrough at Ed Duda to link up with Operation Crusader. The way Layman deals with these chapters makes me think that had Rommel had more troops the link up could have been avoided. As such I think the whole siege can be described in two words, ‘not enough’. Not enough troops to ring the Egyptian border with steel while subjugating Tobruk and not enough troops to breakout from the city! All in all a decent read that at times lacks depth but for a 292 book it is informative and entertaining enough! I am now reading Alamein, War Without Hate by John Bierman and Colin Smith, and already there is a lot of correlation of accounts and evidence in both books. A review will be posted later when I finish it. 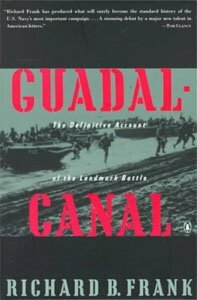 At 618 very dense pages, Richard Frank’s Guadalcanal is best described as encyclopedic in nature. The detail contained herein of the unit by unit, ship by ship, hour by hour detail of the entire six month campaign on both sides is epic. Mr. Frank has said it took over a decade of research to produce this work, and I believe it. Its meticulous research is clearly evident and its sourcework impeccable. If you truly want every detail of the true turning point in the war in the Pacific, this is where to find it. I can truly say I enjoyed the book, and I now feel sufficiently educated on the conflict. I came to the book knowing only the most common known of facts and some basic knowledge of the units involved, greatly because of my palying War in the Pacific. The book is so detailed and so filled with facts, figures, individuals, tactics, units, etc. that one cannot but have total respect and admiration for the author and his researching skills. The appendicies in the book are also an excellent addition to the vast amount of knowledge already in the preceding pages. His handling of the naval battles is masterful, it made it very easy for a novice naval history reader as myself to understand to and to follow the nuances of a naval engagement. I particularly like how he wrote about several engagements from the point of view of each side. It is incredible how much naval battles can turn on one incident! Likewise I was surprised at the amount of frinedly fire involved. His handling of Savo Island and Tanaka’s action at Tassafaronga made me feel inside those ships at time. What struck me the most was the amount of mistakes both sides made, though I am well aware that hindsght is a substantial luxury! From bothced American planning in the initial stage to the sloth like reaction by the Japanese High Command. Though his retelling of the land battle can get somewhat bogged down at times it is realtively easy to make a clear picture of whats going on. His writing style also adds a lot of character to the book, I particularly enjoyed his retelling of the Tokyo Express convoys but was surprised at the frequency these were intercepted by PT Boats and by the Cactus Air force. I was also pleased that he gave the US Army and the USAAF its rightful place in the conflict. An uninformed opinion may be right in assuming it was just Marine Corps grunts and fliers with some help from the USN that won the battle, though in no way am I belittling their contribution especially in the defence against intial Japanese assaults, eg Ichiki. I was also surprised to learn about the extent of eventual Japanese commitment to Guadalcanal, two and half divisions but also in the lack of foresight displayed by IJHQ. It seemed the Guadalcanal campaign came down to the side that made the least mistakes. Both sides are guilty of naive (USN Savo Island and Tassafaronga) and unforgivable mistakes (lack of air cover for the main Japanese reinforcement convoy). Though both sides had great and inspirational leaders (Tanaka, the Japanese major who commanded the rear guard, Halsey, Vandergrift, Ellis, Foss) these are counter balanced by other leaders less inspirational and decisive (Gormley for example). I was also very surprised at Frank’s handling of Fletcher, perhaps here I am showing my lack of in depth reading into the Pacific Campaign as I had always assumed the Fletcher had always received good press. 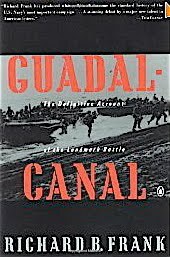 In summary a great, though long read, well researched and I am now much more conversant with the Campign at Guadalcanal and in many ways I agree with the author that though Midway was a dramatic defeat for Japan, Guadalcanal was THE turning point in the Pacific War as the US was able to, in the face of superior Japanese Naval power and support from Japanese bases, gain Henderson Field, defeat the attempts to retake it and to inch its way across the island and start, from there, its march up the Solomons. Read this article in the Yahoo news feed. Might be of interest to those interest in the Pacfic Theatre of War. Here is a link to an interesting article about a HMNZS survey ship playing about with its sonar at Rabaul harbour. Herb’s latest moves in our WitP:AE game has made reread a PDF file I downloaded from the University of New Orleans website. A thesis on the Japanese submarine doctrine that I found very interesting and enlightening. The file is for public use and therefore I can share it with you guys here! Fifth book to arrive in 7 days. This one is by D M Giangreco and published by Naval Institue Press. 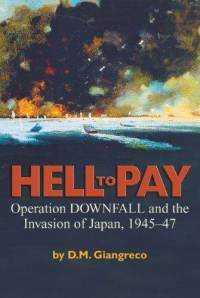 It is about a hypothetical Operation Downfall, the Invasion of Mainland Japan that was divided into two separate landings Operation Olympic and Operation Coronet.. I am really looking forward to this as Olympic and Coronet are scenarios many wargames and wargamers have acted out. Scanning through the book, one of the chapters is titled ‘Half a Million Purple Hearts’ ! Looks promising and I shall start on it once I finish Frank’s Guadalcanal. Has anyone read Hell to Pay? Any thoughts? Yep it got here earlier than expected. Richard Frank’s Guadalcanal will soon be living on bytesanddice’s bed side table as I eagerly devour this acclaimed piece. Some nice photos as well, though many are the commonly known ones of the Wasp, Hornet and Enterprise being attacked. Some great ones of several battle damaged cruisers I hadnt seen before. Will post a review when I finish!